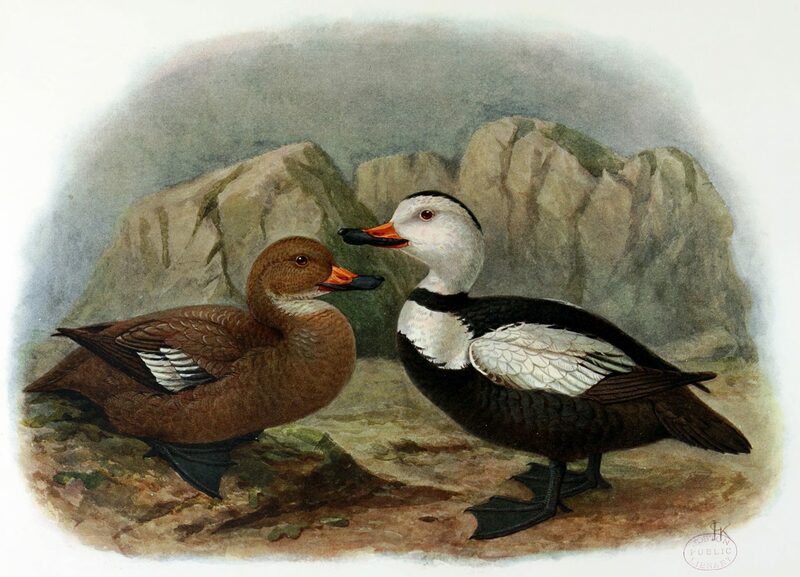 The Labrador duck, also known as Pied duck and Skunk duck, is an extinct North American bird. They went extinct in the late nineteenth century. In fact, they were quite rare when the European settlers came in the United States for the first time. It is believed that they were the very first bird species, endemic North American, to get wiped out after the Columbian Exchange. Size 20 inches in length (head to tail tip). Weight 1 pound to 1.5 pounds (female weigh less than male). Bill Wide and flattened tip along with numerous lamellae inside. Their bill was also soft suggesting that they did not use it to probe food or sediment. Plumage Dense, blended and soft. They were primarily brownish-grey, while darker on the head, back, cheeks, abdomen and rump. Head Oblong and moderate in size. Feet Webbed, short and strong. They were grayish blue in color. Tail Short and rounded; made of fourteen tapering feathers; brownish-black, tinged with grey. They fed on small snails and small molluscs, crustaceans from shallow water. This species preferred to dwell in sandy sheltered bays, inlets, estuaries, sandbars and harbors. In the winter, they migrated off to the coasts near New Jersey, Long Island and New England. It is believed that their breeding colonies were in the Gulf of St. Lawrence, Northern Quebec and Coastal Labrador, Canada. This bird’s meat was known to taste bad, and it used to fetch a low price at markets around United States and Canada. The last reported sighting came in 1878 from New York. One male specimen shot in 1875 in Long Island is now preserved at the United States National Museum in Washington DC. Labrador Duck was sometimes caught by fishermen’s fishing lines baited with molluscs. 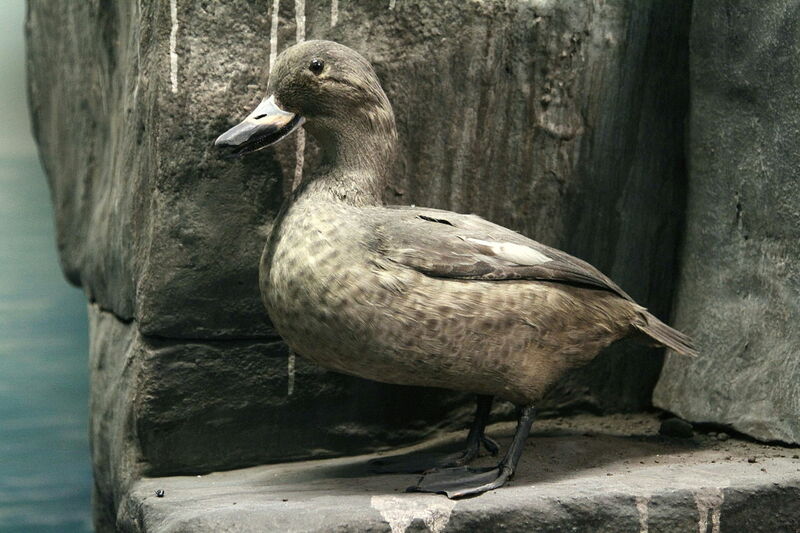 This species was also sometimes referred to as Sand Shoal duck because of its habit of feeding in shallow water. 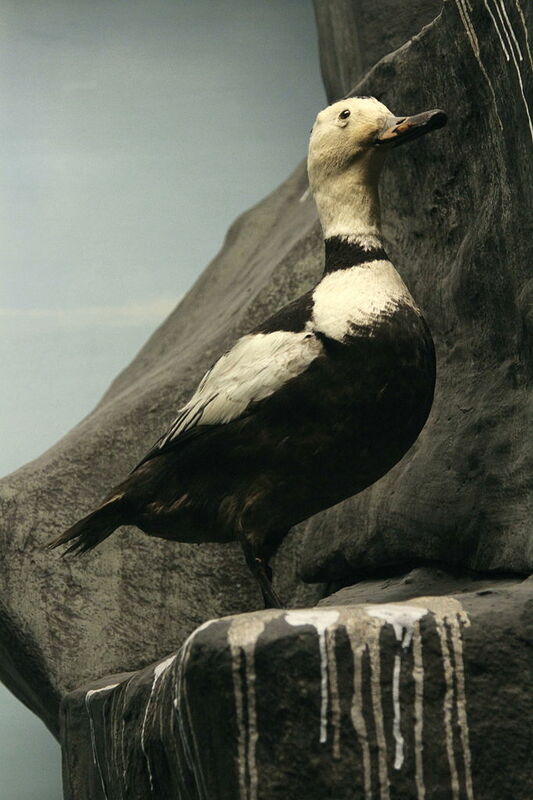 Their closest evolutionary relative was apparently the Scoters (Melanitta). Labrador duck was always rare. This species was never recorded to be present in great numbers. But after 1850, their population further went down. There are several hypotheses that go around regarding their extinction – such as hunting for meat, over-harvesting of its eggs, shortage of its dietary needs in its native range. Increased human influence on the coastal ecosystems forced the birds to flee their native range and look for an alternative one that triggered their extinction. Some researchers had suggested that this bird might never have existed as a full species. 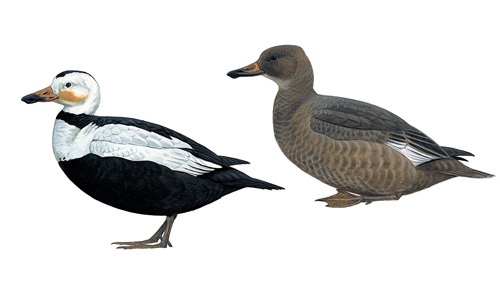 It is possible that they were a hybrid between Steller’s Eider and Common Eider. For some bird lovers, this idea was worth considering given the plumage pattern of the male that was similar to both Eiders. The odd bill structure was similar to Steller’s Eider. If it were really a hybrid, that would explain why they were not very common, and its hypothesized breeding grounds are still conjectural. As of now, no reliable mtDNA sequences test(s) have taken place to fix this idea. 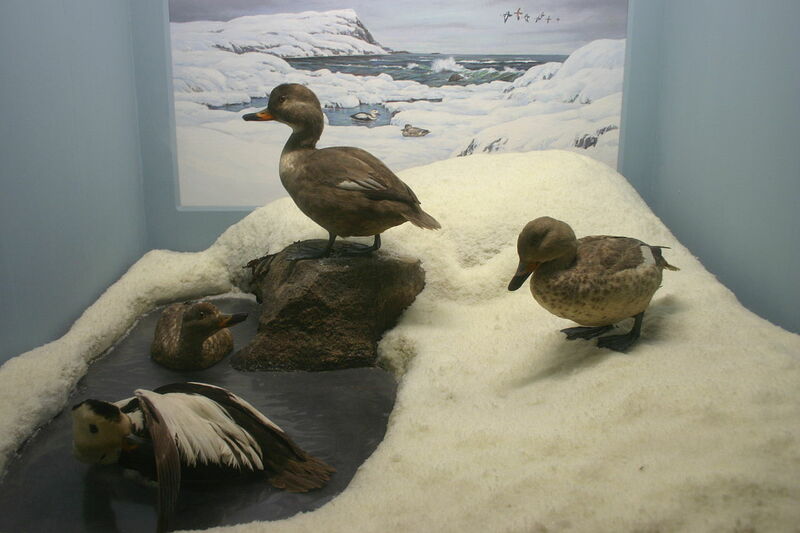 There are 55 preserved specimens (54 according to Naturalis Museum) of Labrador Duck that can be found in museum collections across the world. Published on June 19th 2015 by admin under Birds. Article was last reviewed on 19th June 2015.